In May 1993 the British Mountaineering Council met to discuss the future of high altitude tourism. Of concern to attendees were reports of queues on Everest and reference was made to mountaineer Peter Boardman calling Everest an ‘amphitheater of the ego’. Issues raised included environmental and social responsibility and regulations to minimize impacts. In the years that have followed there has been a surge of interest in climbing Everest, with one day in 2012 seeing 234 climbers reach the summit. Participation in mountaineering tourism has surely escalated beyond the imagination of those who attended the meeting 20 years ago. This book provides a critical and comprehensive analysis of all pertinent aspects and issues related to the development and the management of the growth area of mountaineering tourism. By doing so it explores the meaning of adventure and special reference to mountain-based adventure, the delivering of adventure experience and adventure learning and education. It further introduces examples of settings (alpine environments) where a general management framework could be applied as a baseline approach in mountaineering tourism development. 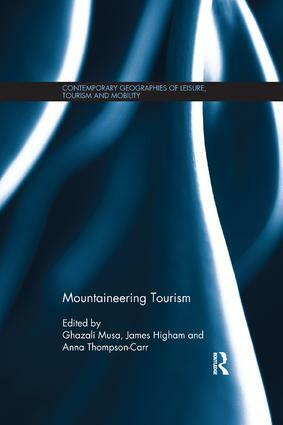 Along with this general management framework, the book draws evidence from case studies derived from various mountaineering tourism development contexts worldwide, to highlight the diversity and uniqueness of management approaches, policies and practices. Written by leading academics from a range of disciplinary backgrounds, this insightful book will provide students, researchers and academics with a better understanding of the unique aspects of tourism management and development of this growing form of adventure tourism across the world.